I have worn and discarded countless masks through my life, trying on different ones, depending on what part of my interior life I wanted to hide. The disguises helped me survive in junior high locker rooms, corporate board rooms, Bible study classrooms, and new friends’ living rooms. Or so I thought. A woman’s arms get tired holding up masks, year after year. But sometimes, you tolerate the wearying task of wearing a mask. Because sometimes, it feels easier to hide, rather than to let the Real You show. So you muscle through, taking your assortment of masks to the carpool lane, the parent-teacher conferences, the dinner parties. On the inside, your actual heart knows better. Your actual heart beats to be actually real, but you aren’t sure how. You assume that people want someone a little less … you. Sometimes, it seems easier to stubbornly camouflage the blemishes, blackheads, birthmarks and blisters of life. And sometimes? After years of half-false living, you can barely tell where your masks stop and your skin starts. And you don’t know how to find the real you again. I’m 43 now, and I’d like to tell you that I never wear masks anymore. I have thrown most of them aside, but my default is to reach for a mask when I want to make a good first impression. God’s soul-whispers have helped me ease into my own skin, my own size of jeans, my odd sense of humor, and my inability to bake anything other than brick-hard brownies. I’ve learned that all those years of mask-wearing didn’t really get me anywhere after all. In truth, I had masked myself into being nearly unapproachable. —a book for the bone-tired mask-wearers—and she wanted me to know what the book had meant to her. I sat in the lightwash of my computer screen for a long time, shaking my head with a tinge of regret over all that I’d missed in an attempt to be someone more than I was. I had, indeed, achieved my goal of being “so together.” But all of my careful impression-management had alienated a potential friend. I can’t go back and erase my masks, and I won’t wallow in guilt for my past mistakes. Because I can start again today, refusing the false face. And I can do the same thing tomorrow. And even more, I can make safe zones for others to be the best versions of themselves. I can teach my daughters to live mask-free—mostly (I hope) by modeling that behavior. We weren’t made for masks. And the bravest ones are the women who let their masks fall, before they inevitably break. The bravest ones go first, wearing their gritty real on the outside—scars and all. In Christ, we are free to be imperfectly who we are. And the very things that we think might repel others (our bed-head hair with its own zip code, our bug-splattered windshields, and our feisty muffin tops) are the actual “flaws” that make us approachable. That make us real. That make us friends. That underneath the mask isn’t your mess; it’s your marvelous. Be sure to check the sidebar later. I’ll be featuring one of you over there! Lisa Burgess is our latest featured writer. Oh, those crazy masks. 🙁 I’m so glad we’re free to take them off now. I remember wearing the plastic kind on Halloween years ago. They were always uncomfortable. And were never the faces we were made to show! Thanks for sharing this, Jennifer, and thanks for sharing my post on your sidebar! I’m honored. I love this post and your blog’s overall message that we are already “pre-approved in Christ” (no striving necessary). Even if some reactions aren’t what we expect, when the goal of “having it all together” is relinquished, we can still be who we are, flaws and all. Thank you for reinforcing the message that God loves us in spite of our imperfections and He thinks we are beautiful! How many masks have I worn in my past to be acceptable, to fit in, to avoid even knowing myself, or, tragically, not wanting to know the Lord? All too many to count. But I rejoice in how the Lord has moved me, changed me, freed me to be the person without the mask, the one He wants to see, the one who lives for Him and His approval, not the approval of man. Do I fall down? Do I fail? Oh, sure, but now I have the confidence to ask forgiveness and ask Jesus to pick me up and set me to rights. Thanks for this inspiration today, Jennifer! Oh how this resonates with me. For us it was a mask or masks of a different type. It was the mask of “the perfect Christian couple”. (However that is defined.) We were speaking at a weekend couples’ retreat. We were organized, prepared, and appropriately leader dressed. The weekend was going well, couples seemed engaged, good questions were being asked. Then the final morning arrived. The Holy Spirit convicted us to tell our story. We pulled up two chairs. Our masks came off. We began to tell our very real, very ugly story of where our relationship had been. We shared from hearts so broken that only the miraculous power of God could mend them. We hurt anew. Our tears flowed. The couples saw real pain, real love, heard about God’s healing hands. Audience tears flowed. Couples told us they now felt hope for their own struggles. More than once we were thanked for our honesty in sharing that we were not a “perfect Christian couple”. Last summer, over 10 years after the retreat, a man came up to my husband and said, “I remember your words each day and know that only by God’s grace, by being real, and by being intentional is our marriage what it is today. All glory and praise to God who removed our masks. Through the Spirit’s leading we became real with God and with each other. Our theme is Psalm 115:1 Not to us O Lord, not to us, but to Your name be the glory, because of your love and faithfulness. I can relate to every word of this! The imperfect people that are covered by an outer persona of the perfect person we wish we could be. I have been covered by masks for a few more years than you, but have learned more about myself in the last few months due to God’s promptings about what “real” is and how He loves us through every bit of the messiness. “The bravest ones goes first, wearing their gritty real on the outside, scars and all.” Thank you for those words that for me state how God is trying to work on me. The song is familiar, I’ve hummed a similar one myself. Isn’t it funny, maybe sad, how those masks scare folks away? All in the lie’s name of “keeping it together”. I LOVE how the Lord redeemed the lost time w/your college friend, how all is not lost. The story is beautiful…and this post is as well. Thank you for being transparent. It’s who I kept out with my masks that I wonder about as well, Jennifer. I guess that is the cruel irony of mask wearing.. we wear them to gain acceptance and approval, but in reality they alienate us from the very people we are trying to “attract,” while killing our souls in the process. Thanks for writing this! So grateful to have read every single word of this post. On Sunday, I had opportunity to share a similar message to my son, encouraging him to be himself. Those around us do not need a duplicate of another person. 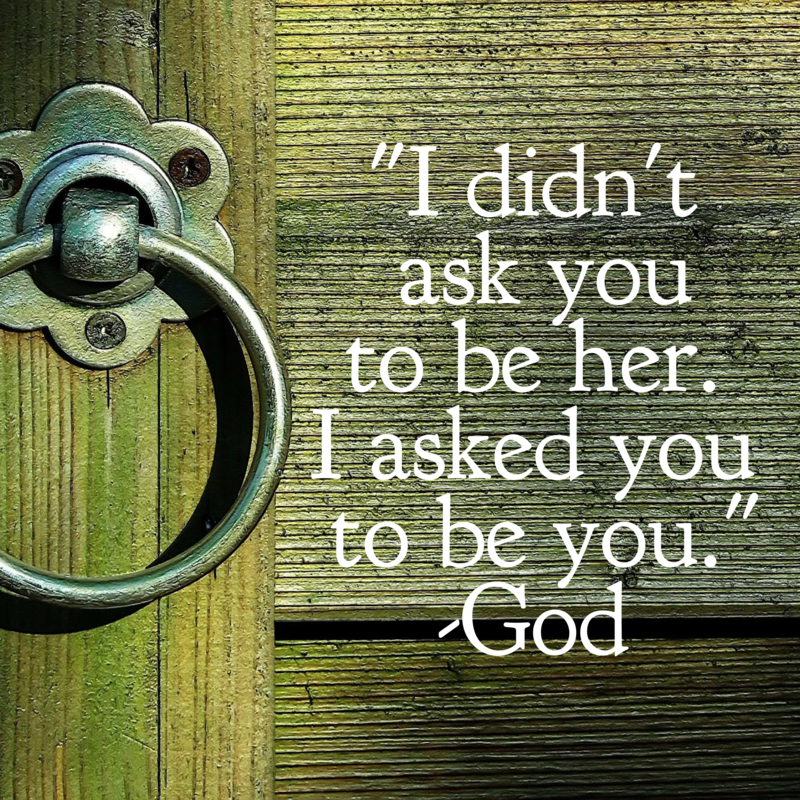 They need us to be the person God created us to be. May you keep sharing the message as we all tend to forget from time to time 🙂 Have a blessed Wednesday! Thank you for your insight and reminder to be who I am. My flaws being a banner and making me more approachable is something I need to remember more often when I’m in the moment with others. Instead of squirming in my own skin I need to get to a point of acceptance. Your actual heart beats to be actually real, but you aren’t sure how. You assume that people want someone a little less … you. I still catch myself thinking this… Thanks for being real! Oh how you “get” me. I’m often afraid that I’ll be too much for people if I take off the masks. Thankfully we aren’t too much for Him. Thank you for these words Jennifer and for pointing us to authentic living in Jesus. This was a well-timed read for me. I’m getting ready to go into a season of speaking events, and I’m thinking about my flaws and wondering what on Earth I might have to offer these women. But the real me is what I have to offer them. Thanks for reminding me of that, Jennifer. Fabulous post and so perfect for the women we serve at GateWay of Hope. This is so perfect. Feeling like people want someone “a little less…me?” Yeah. I get that. Thank you. Oh. Yes. I’m 56, and am smashing masks right and left! Praise God! Thank you for this post, Jennifer. Amen. I’m learning that our masks take different forms and some of them are so subtle, we don’t even realize we are hiding behind them. 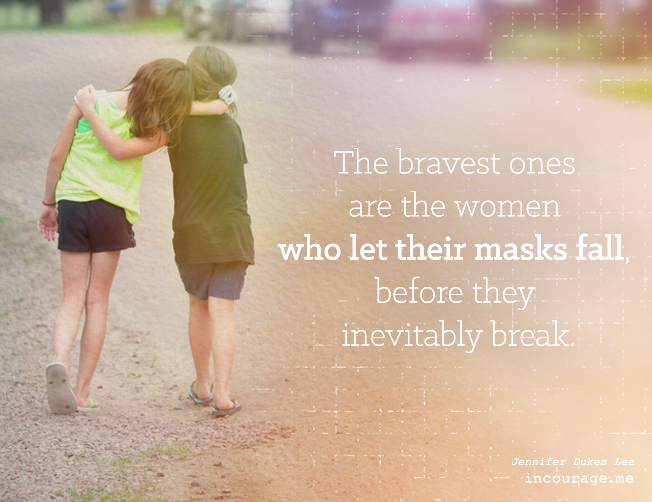 I love the idea that bravely setting aside our masks encourages others to do so as well. Not the mess but the marvelous – oh how we (I) need to fully grasp that. Thank you for yet another beautiful, thought provoking write! I want my MAH-VELOUS to show! Love this! That final line is so beautifully true! Thank you for the encouragement! I love this, Jennifer. Thanks for being real and sharing real. And that’s what it’s all about. HE knows us through and through and we can’t hide no matter how many masks we wear. And as we get naked and unashamed, well, I think it’s like passing the bravery forward…and helping set others free! Thank you so much. I love the thought that my “marvelous” lies beneath my masques. Thank you, Jennifer, for the encouragement to be honest and true to ourselves in our relationships with others. Without approachability, our shining lights won’t be of much use.